For learn how can we use $interval service for Auto refresh of Div content without refresh of web page. So, here we have use PHP script and make simple Chat application by using AngularJS with PHP. In this chat application we have load chat data in Div tag by using AngularJS function which call PHP script for fetch data from Mysql data and display under Div tag. Now we want to auto refresh this Div chat data on every 5 seconds, for this here we have use $interval service of Angular. This service we can use same as setInterval(), in this service also we have put our fetchData() function and set time interval of 5 seconds, so on every 5 second $interval service has called fetchData() function which send request to PHP script for fetch data from Mysql chat table and then after it will display under Div without refresh of webpage. If want to make robust web application by using AngularJS with PHP then this source code will helpful. 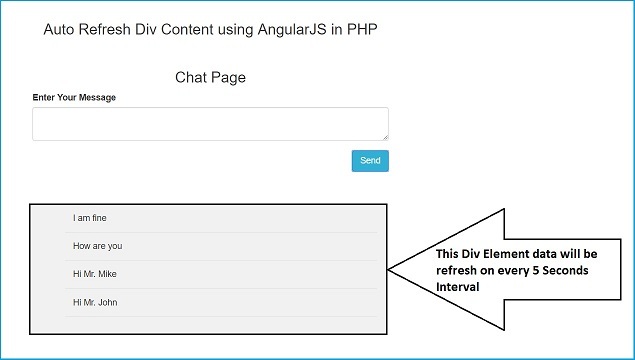 So, this way it will auto refresh div content by using AngularJS $interval service with PHP.